Rome, Italy: a hub of inspiration for aspiring painters and sculptors all around the world. Recognized for its collection of truly classic art, it’s home to some of the most beautiful museums of art and architecture known to man. One of these fascinating, and renowned, museums is the Borghese Gallery. The Borghese Gallery in Rome has history as rich as its art. The Borghese Gallery’s baroque paintings and antique sculptures alone are remarkable, but the history behind the gallery and the family that founded it is equally as intriguing. In fact, most of the artwork and antiques there today were contributed by the founders of the museum, the Borghese family. The family’s legacy in Rome began in 1541, when Marcantonio Borghese first moved there. The family’s power and wealth skyrocketed when his son, Camillo Borghese, became Pope Paul V less than 70 years later in 1605. Pope Paul V was intelligent, and knew just how to keep the family in great power by appointing family members into high positions, even making his adoptive son Scipione Borghese a Cardinal of the papacy. They retained monopolies on things such as grain and inns, well-managing their power well into the 19th century. Although the majority of the Borghese Gallery contributions were made by ancestors from the 17th-19th century, the family remains notable to this day. The Borghese Gallery itself is housed within the Villa Borghese, which used to be the family seat before it was acquired by the Italian government in 1902. The Villa Borghese was built between 1613 and 1616, and was designed by a Dutch architect by the name of Jan van Santen. A true piece of art itself, the architecture all around the Villa Borghese is a powerful tribute to its time. Stepping onto the grounds, you feel as if you’d stepped into another century, long ago when the powerful Borghese family ruled Rome by Pope Paul V’s papal authority. 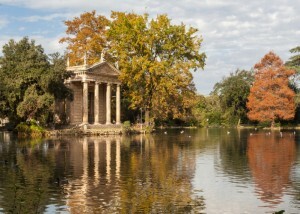 Visit Rome, Italy and see the Borghese Gallery in person! AESU offers several trips to Paris, France, including: Cosmopolitan, Explorer, Euro Focus, Great Escape, Viva Italia, and Euro Spree. Explore Rome and its stunning architecture and classic art, and visit the historic museums. If you have any questions or want help booking your Rome, Italy adventure, please contact AESU by calling 800-638-7640, or fill out the contact form found on our website. This entry was posted on Thursday, November 19th, 2015	at 4:00 pm	. You can follow any responses to this entry through the RSS 2.0	feed. Both comments and pings are currently closed.